Long-term care insurance consumers — usually upper-middle age and older Americans — face enough hurdles in finding the best policies. Complicated contracts, high fees and charges, and booming premiums await any long-term care insurance buyer. On top of that lurks another, more sinister issue for buyers, and it’s one of the worst forms of elder fraud — long-term care insurance fraud. It’s a big problem, given the skyrocketing costs of long-term care services these days, and the burgeoning need for long-term care financial help. According to a 2017 study by Genworth, the median monthly cost of long-term home healthcare services is $3,994, and the median cost of a semi-private nursing home room is $3,750. Long-term care insurance fraud comes in many forms, experts say. Faulty policies: Unsuitable long-term care policies tend to favor maximum profit over a person’s unique health care needs. Potential traps include policies with ultra-high premium costs and insurance companies that try to sell two overlapping long-term care insurance policies when only one is needed. Upgrade scams: Often, long-term care insurance scammers will try to “churn” a long-term care customer by making them cancel their current policy and plug in a new, more expensive policy that offers no benefits over the old policy. Churning is particularly onerous given the fact that when an existing insurance policy ends, premiums paid out on the old policy are forfeited. Additionally, pre-existing conditions that weren’t in play under the old policy may drive up premium costs on the new policy. Phony policies: Long-term care insurance scammers may also try to sell bogus policies that accept the customer’s premiums, but don’t pay out any cash when the insurance is needed down the road. Long-term care consumers should always check with their state’s insurance department to validate an insurer before signing on the dotted line, and make sure the company is licensed to sell insurance in your state. 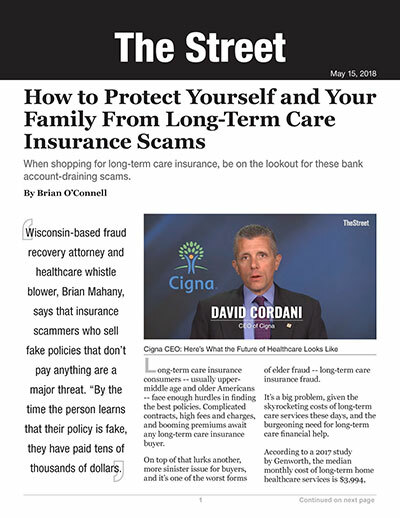 Long-term care insurance scams also can include other trap-doors that can lead to non-coverage, says Brian Mahany, a Wisconsin-based fraud recovery attorney and healthcare whistle blower. “Long-term care insurance fraud can also include falsely representing benefits of a long-term care policy (i.e., saying they will cover all your long-term care needs) and high-pressure pitches to sell expensive policies (the insurer will warn you about being a burden on your kids),” he says. Mahany says that insurance scammers who sell selling fake policies that don’t pay anything are a major threat. “By the time the person learns that their policy is fake, they have paid tens of thousands of dollars,” he notes. Seniors and family caregivers can nip long-term care insurance scams in the bud by getting together, thinking like a team, and being smart about long-term care decision making. “(Family) meetings are a good idea, but consider having a facilitator in the room to help remove sibling politics and keep the conversation focused on the financial health of your parent,” advises Frank McAleer, senior vice president of wealth, retirement and portfolio solutions at Raymond James. Families can also incorporate digital tools earlier in the process to manage senior long-term care decisions to better avoid any fraudulent activity. “For instance, [online fraud protections and remediation tools] can assign a trusted contact to receive copies of financial transactions in real-time,” McAleer says. Creating an effective, sustainable long-term care strategy, whether on your own, or in a family setting, is hard enough without the prospect of fraud hanging over your head. Stay on track by being vigilant about long-term care insurance decisions, vet any and all providers, and bring in a trusted financial professional if there are any doubts at all about the veracity of a long-term care insurance provider. Do that and you’ll keep fraudsters at bay, and your long-term care plan on the right track for years to come.